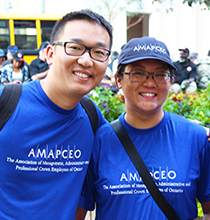 AMAPCEO offers skills-based workshops, training, and conferences to our volunteers and signed members on a range of topics, including negotiations, equity, union rights, volunteer mobilization, and more. 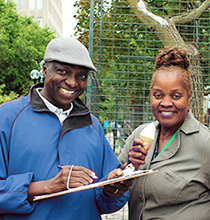 By participating in our educational programming, you can develop a stronger voice in your workplace and advocate for fairness in a variety of areas. Signed AMAPCEO members have access to a growing number of online, in-person, and blended courses through the AMAPCEO Education Program. Not yet a signed member? Join for free. In 2015, AMAPCEO adopted Roadmap to Building a Stronger AMAPCEO: Strategic Directions 2015–2020. The goal of Strategic Direction #3, Member and Activist Education & Leadership Development, is to educate, train, and engage members to create the next generation of leaders so that our union will be stronger, more united, and more effective with a broader activist base that reflects the full diversity of our membership. To achieve this goal, the Board of Directors gave the Education Committee the mandate to develop a long-term educational plan developed specifically for AMAPCEO.